If you are shopping for a new home, you have to inspect the condition of the roof with the help of a roofing contractor North Myrtle Beach. Roof certifications are not generally included in a typical home inspection and they are not usually included in the purchase contracts. Let say, you have found your dream home. However, it has a shabby roof. You should ask the real estate agent as well as the seller how they can sell the house if it does not have a new roof. In some locations, city regulations do not need that sellers change failing roofs. There are cities with Truth-in-Housing regulations and guidelines that oversee repairs before the resale. Don’t forget to check for the cities where you are planning to buy or sell. If it is in a seller’s market, the condition of the roof might not really matter. There could be a large hole in the roof that allows rain to pour down directly into the living room and there are still some buyers who will take this property. Whether you get a roof certification will be determined by the kind of real estate market that is present at that time. When the market is unstable, and commonly in seller’s markets, a roof certification isn’t a buyer demand. However, things can be different in a buyer’s market. Flashing around the chimneys, roof pipes, valleys, chimneys as well as the mounting of the HVAC system. If there is no need for roof repairs, the roofing company can provide you with an estimate of the roof’s remaining years of life and then he will certify the roof inspection. The roof certification is good for 2 to 5 years. 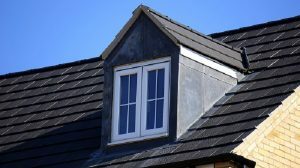 Type of roof – the common roofing materials used are composition shingle, slate, metal, steel, synthetic, clay or concrete tile, wood shake, tar and gravel. Age of the roof – according to some roofing firms, wood shakes need more repairs whenever they are older than 10 years. Meanwhile, tile roofs can last for as long as fifty years provided that no one has walked on them since weight placed in wrong areas can lead to cracking and even breakage. Roof pitch – the roof’s steepness is referred to as the roof pitch. If the pitch number is higher, then the roof is steeper. Number of layers – certain cities have rules about the numbers of allowed re-roofing layers that are installed on top of existing roof before a complete tear off is required. Previous roof repairs – even though not all states need seller disclosures, when a seller doesn’t tell you about previous roof repairs, several roofing companies won’t accept the roof certification. Roofing inspectors prefer to check a previous repair to ensure that it is done correctly to prevent future roofing issues. The primary purposes of a roof certification and roof inspection include informing you, the buyer of the roof’s current condition, disclose the roof’s remaining life span, and to perform roof repairs, if required. Call NMB Roofing Pros if you need roof inspection services for your existing home or the house that you are planning to purchase.